This summer change your life, with our online interactive 12 Week Course: Proof of Past and Future Lives and Liberation from Rebirth. 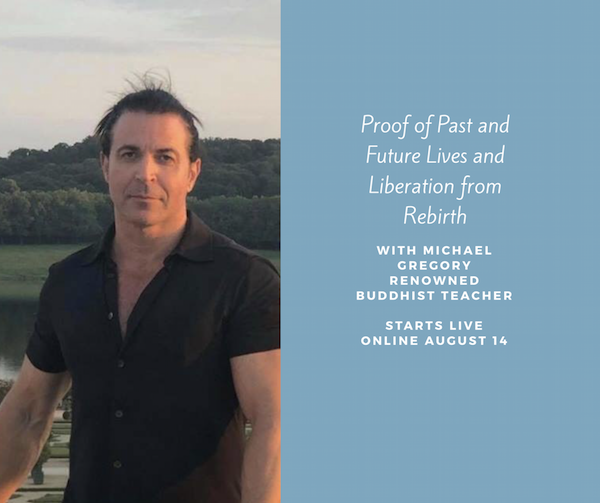 Join Michael Gregory, former investment banker turned Buddhist Monk and The Executive Director of Mindfulness Meditation Centers for the last twenty years starting August 14th. The class will be offered live every Tuesday at 7pm EST through our interactive classroom or Watch Later in our HD Library. We will be using the scholastic text Buddhist Epistemology by S.R. Byatt and Anu Mehrotra with a forward by the Dalai Lama available on Amazon in hardcover or kindle for approx $24. This Course is based upon the ancient texts Compendium on Valid Perception (Pramana Samuchaya) by the Buddhist Master Dignaga (440 AD), the Commentary on Valid Perception (Pramana Varttika) by the Buddhist Master Dharmakirti (630 AD). This course will be offered through our live interactive live online classroom Zoom every Tuesday at 7pm EST with Michael Gregory. Or watched later in our HD Video Library. There will be weekly quizzes and course notes provided. There is no cost to register for this course all MMC offerings are by Generosity- Donation Only. Register ahead of time to ensure participation. This is course four of the traditional ten year monastic college curriculum. You may also sign up for our Teacher Training and previous course offerings available now in our HD Video Library. You will receive a certificate of completion at the end of each course.